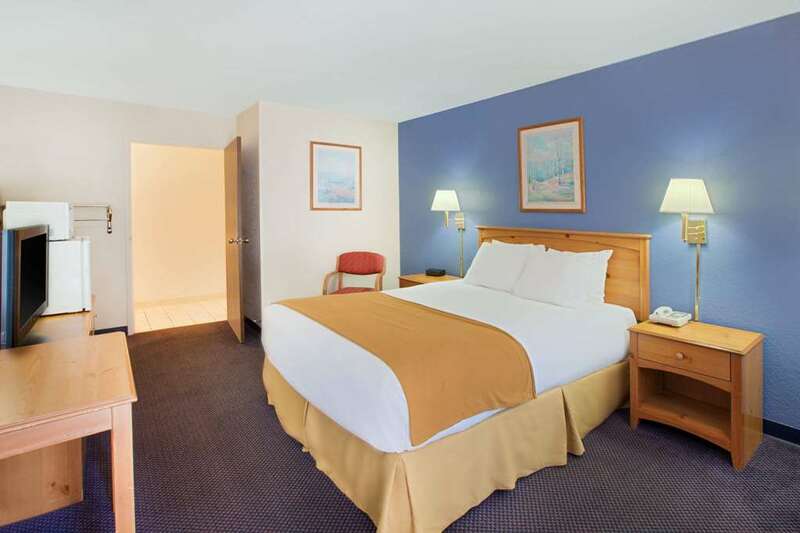 Relax and enjoy your stay in Mackinaw City at the Days Inn and Suites Bridgeview Lodge. The convenience of a great location coupled with fabulous amenities are sure to please. We guarantee a great room at a great rate, with breakfast included and the opportunity to shop, dine, explore all while earning Wyndham Rewards points. Conveniently located off I 75 Exit 339. Just a short walk from downtown Mackinaw City, where you will find fine and family dining, and unique boutiques. Located at the foot of the world famous Mackinac Bridge, next to Colonial Fort Michilimackinac and Old Point Lighthouse. Parasailing, boating, fishing, golfing, Thunder Falls Water Park, Old Mill Creek, Castle Rock, the Deer Ranch, and the list goes on of great attractions within a 10 minute drive of the hotel. 59 Spacious Sleeping Rooms Jacuzzi and 2 and Room Deluxe Lodge Suites with Private Balconies Complimentary Day Break Hot Breakfast Indoor Heated Pool, Spa and Sun Deck Elevator Interior and Exterior Corridors Ice Machines on all floors Vacation Packages Available Expanded Cable TV including HBO, CNN, ESPN1, ESPN2, FOX News, Local Channels and much more. 24 hour Fax and Copy Service 24 hour Front Desk and Concierge Complimentary 24 Hour Coffee Service in Lobby Complimentary USA Today Free Local Calls Wireless High Speed Internet and Free Parking Small Dogs Welcome Free Shuttles to Mackinac Island Ferry & Kewadin Casino Next door to Audies Family Restaurant, Chippewa Fine Dining, and Jrs Tailgate Pub.